The Amish supposedly have a saying that children should ‘break even’ by age 7, contributing as much to the household as they’re getting out of it. That’s a great saying, and certainly my hope with my son Ayhan (now 17 months old). So with that in my mind, my wife and I have been training Ayhan from the day he learned to walk to start helping with chores. So far he sweeps, helps picks up his toys (and often then dumps them back out again—that’s the fun part after all), helps to load and hang laundry, wipes down the table with a sponge, and pretends to cook. He even tried his hand at vacuuming recently! Hopefully one day he’ll do all of these and more, contributing in a real and significant way to the functioning of our household. Obviously I’m not advocating for the return of 12 hours a day of child labor in dangerous conditions, but active engagement in all the aspects of running the household is a valuable part of a child’s education. 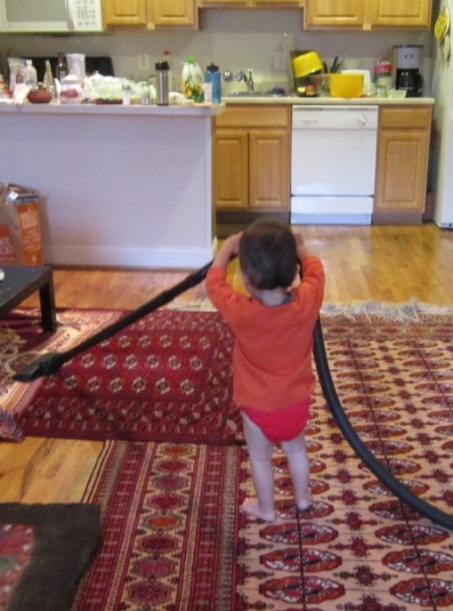 Plus, it can be helpful, fun (he’s enjoying chores so far at least) and provide valuable skills. I certainly did some chores as a kid—I still remember when my dad would wake me up early many Saturday mornings with a loud bang on my door to join him outside and help him rake leaves or whatever needed doing. But in retrospect I could have done much much more, if I hadn’t been so busy watching TV or playing video games. And I probably would have benefited from this additional work too. For example, I wish I had learned to cook when I was a kid—to the point I actually became comfortable with cooking—as that would have been very useful when I finally needed to start cooking for myself after college. And it surely would have taken a bit of the burden away from my mom. (For those of you with kids old enough to cook, here’s a good New York Times article about one mother getting her 10 and 14 year old sons cooking in the kitchen). 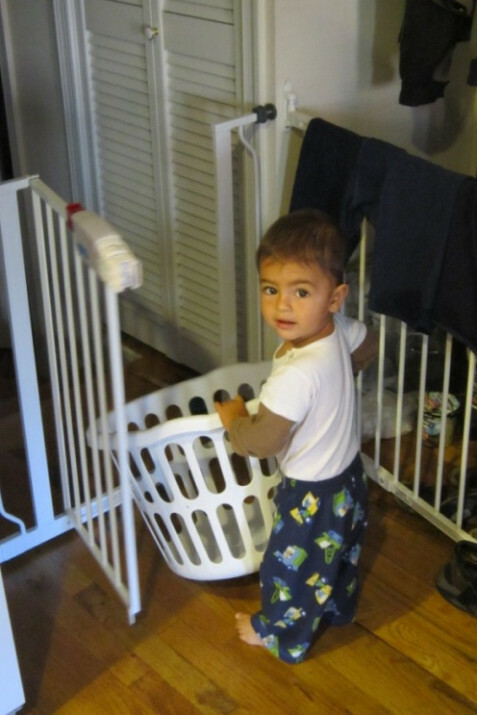 Enough said on this: engage your toddler with chores now before he has any sense that adults might not actually find these activities fun (this is not intuitive to kids, especially considering the frequency with which adults do chores!). It worked for my mom; she got me vacuuming young and by the time I realized I hated this activity, it was too late, it was my role in the household. I plan to do the same with Ayhan with a whole slew of chores, but hopefully my son will fully grasp how essential his role is in keeping the household running, and not just think I’m a mean old dad. And without TV and other distractions, hopefully he’ll have more time and inclination to devote to those duties, and fewer distractions to pull him away.